Tabloids sold in the Duchy of Stonehold claim that the High King, Caliph Howl, has been raised from the dead. His consort, Sena Iilool, both blamed and celebrated for this act, finds that a macabre cult has sprung up around her. As this news spreads, Stonehold — long considered unimportant — comes to the attention of the emperors in the southern countries. They have learned that the seed of Sena’s immense power lies in an occult book, and they are eager to claim it for their own. Desperate to protect his people from the southern threat, Caliph is drawn into a summit of the world’s leaders despite the knowledge that it is a trap. As Sena’s bizarre actions threaten to unravel the summit, Caliph watches her slip through his fingers into madness. But is it really madness? Sena is playing a dangerous game of strategy and deceit as she attempts to outwit a force that has spent millennia preparing for this day. 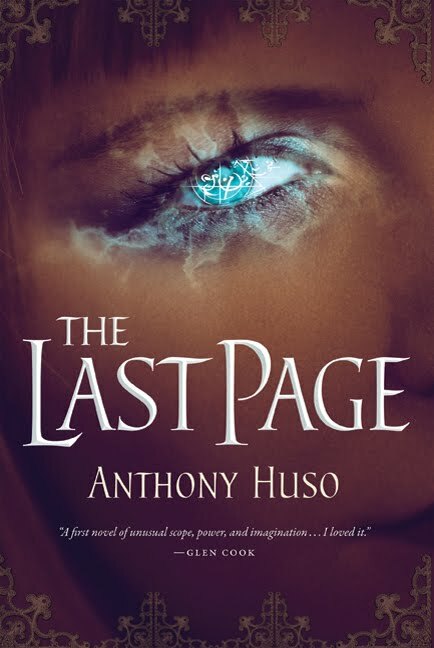 Caliph is the only connection left to her former life, but it’s his blood that Sena needs to see her plans through to their explosive finish. Sounds intriguing, right? But it was when I saw yesterday’s Facebook post from the distinguished Dave Truesdale, Black Gate‘s Managing Editor for our very first issue, that my interest in the book was truly piqued. I absolutely loved this book. 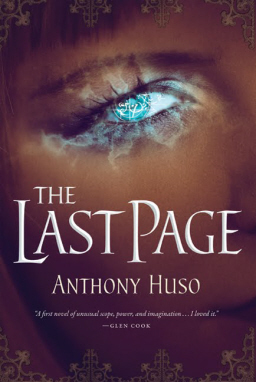 I bore easily but this one not only kept me turning pages, but I was utterly fascinated with the entire convoluted, enthralling blend of magic, grotesqueries and gods reminiscent of HPL’s Old Ones, the epic and at the same time down to earth scope (noir fantasy? ), and the beautiful, many times poetic prose. As soon as I can gather my thoughts into some kind of coherency I’ll be writing this up for SF Site. This one is a stone-cold winner, the author’s second novel, and the second and last book of his diptych begun with The Last Page from 2010. Just wow. I don’t often hear a book described as noir fantasy, or its grotesqueries and gods as “reminiscent of HPL’s Old Ones.” Strong praise indeed. This one is on my short list. 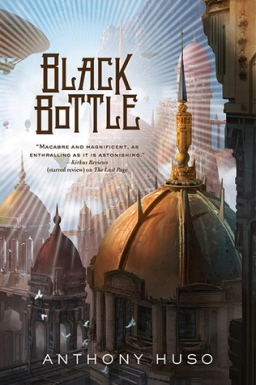 Black Bottle was released by Tor Books on August 21. It is 445 pages in hardcover and prices at $27.99 in hardcover ($14.99 for the digital version). Read all of our recent New Treasures posts here. Yeah this thing was cool. I got the first book but didn’t read it until the other half was out. It’s really nice to see someone taking the road of Smith-Vance-Wolfe. Husos’ got guts if nothing else. Husos’ work here has pretty much gone pretty deep underground. Deeper than Enge, HAJ, and other BlackGate alumni. Hardly a mention of this Huso dude anywhere. MDSs’ old review in my physical back issue of BlackGate Magazine was about it. That’s not an entirely favourable review either. MDS lays some subtlety harsh charges on Huso though he starts out fairly gentle. The most vigilant ‘RequiresThatYouHate’ + OF Blog of The Fallen blogs ( google ’em people. A most fascinating pair of sorts those two folks ) overlooked this + those kids seem to catch everything. Anyways this is a decent combo of the already-turning-moldy-steampunk-flood + the most-definitely-a-mummified-teat-epic-fantasy-monument-to-marketing. I’m not sure I buy into those who see steampunk elements in Black Bottle. Yes, there are zeppelins, but so what? Zeppelins–in and of themselves–do not a steampunk novel make. Yes, there are alternate forms of bio-chemical fuel that make electricity work, but this in itself is not steampunkish in any way I’ve come to know “steampunk” as. The term steampunk, I think, is tossed around too lightly today, primarily because there _has_ been so darn much of it (and of which I tire). Steampunk recalls more the Victorian gaslight romance era, rather than the few elements in Black Bottle that some have glommed onto as what they’re used to seeing in true steampunk books, and these elements seem to automatically present themselves as symbols of steampunk whether they truly are or not, which I don’t think they are in Black Bottle. Using the word steampunk even to partially describe the atmosphere of Black Bottle I fear might turn some off to the book, those who, like me, are rather tired of the new-subgenre. Black Bottle (and its predecessor) are set on an entirely different world from Earth, with its own lands, cultures, peoples, science, medicine, and magic. Using the strange (to us) forms of energy they have naturally, or have invented/discovered has given rise to zeppelins as the preferred vehicle of mass transit in the air. I don’t see this as steampunk in and of itself. Others may offer opposite views, of course. Maybe I’m missing (or have forgotten) something or just define steampunk differently. > Hardly a mention of this Huso dude anywhere. If that’s true, I think this latest book might well change that. It seems to be getting a lot of attention! > I’m not sure I buy into those who see steampunk elements in Black Bottle. I certainly agree. However, when marketing folks describe a book, then tend to use familiar terms whenever possible. Let’s face it — “steampunk” is more familiar to most readers than “an entirely different world from Earth, with its own lands, cultures, peoples, science, medicine, and magic, with zeppelins as the preferred vehicle of mass transit in the air,” even if the latter is more accurate. Yeah, you’re probably right, John. Pretty soon we’ll see some story labeled as steampunk somewhere because it has a slinky in it and it will birth a whole new sub-genre of steampunk called slinky-punk.